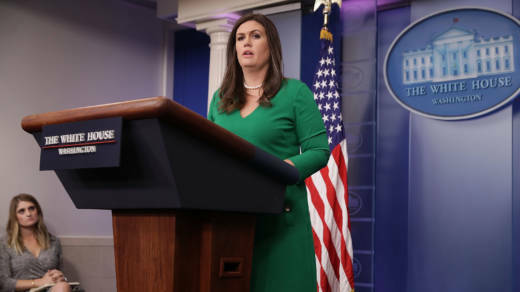 "I think one of the things we don't want to do is try to create laws that won't stop these types of things from happening," Sanders said Monday. "I think if you look to Chicago, where you had over 4,000 victims of gun-related crimes last year, they have the strictest gun laws in the country. That certainly hasn't helped there." Pointing to Chicago to suggest that gun laws don't work is not a new talking point — Trump claimed Chicago had "the toughest gun laws in the United States" in a 2016 presidential debate; his fellow Republican candidate Chris Christie likewise pointed to Chicago as a place with high crime despite tight gun laws. And the rhetoric goes beyond politicians. The right-wing site Breitbart has on many occasions posted articles with headlines containing the phrase "gun-controlled Chicago." This can sound like a potent talking point — it is a huge city with a notorious crime problem, which Trump already used regularly to talk about creating law and order. It also packs the added rhetorical punch of being closely linked to President Barack Obama, whose actions Trump has worked hard to undo. But while gun violence in Chicago is high, the rest of this common talking point doesn't really hold water. It's true that there were more than 4,000 shooting victims in Chicago in 2016. It's also true that Chicago has suffered a massive amount of gun crime recently. In 2016, homicides in Chicago sharply rose, mostly as a result of gun homicides, as the University of Chicago crime lab found in a January report. Gun homicides in the city rose by 61 percent between 2015 and 2016. That helped make the gun homicide rate in Chicago particularly huge compared with similar cities. The rate was 25.1 per 100,000 residents in 2016, compared with 14.7 in Philadelphia and just 2.3 in New York. It also had a relatively high number of guns recovered — 243 per 100,000 residents. That's roughly on par with Philadelphia and much higher than Los Angeles or New York. But it's not true that Chicago has the toughest gun laws in the country, as other fact-checkers have also repeatedly found. It is true that Illinois has tougher gun laws than many other states. The state is one of seven that requires licenses or permits to buy any firearm, and it's one of five that requires waiting periods for buying any firearm. The Law Center to Prevent Gun Violence, which tracks gun laws nationwide, has given the state a B+ for its gun laws. Chicago itself has some tough laws — there is an assault-weapons ban in Cook County, for example. But it's not true that Chicago has the strictest gun laws in the country. At one point, it did have much tougher laws — it had banned handguns in the city limits, but a 2008 Supreme Court ruling declared that ban unconstitutional, and a 2010 ruling reaffirmed that. The city also had a gun registry program since 1968, but ended it in 2013 when the state passed a law allowing the concealed carry of weapons. "We generally think of California as having the strongest gun laws in the country," said Hannah Shearer, a staff attorney at the Law Center to Prevent Gun Violence. "The whole state's laws are pretty strong." The center has given California an A rating and ranks it No. 1 in terms of the tightness of its gun laws. California bans the open carry of guns and requires background checks on private firearm sales, among other things. "Some cities go even beyond that," Shearer added. "San Francisco has a safe storage law, requiring that guns kept in the home are kept locked." That's a regulation that Chicago, for example, does not have. Quibbling over exactly what part of the U.S. is No. 1 in terms of gun-law strictness, however, isn't the most compelling part of Sanders' statement. She also said that having gun regulations "certainly hasn't helped" in Chicago. That's a much more controversial claim — and it doesn't stand up to scrutiny. It's important to remember here that Chicago is very close to two states that have relatively weak gun laws: Wisconsin and Indiana. So while it's easy to pick on Chicago (or any other high-crime city) for its ugly statistics, says one expert, taking bordering states into account weakens this gun-advocacy talking point. "It's not a scientific study. It's an anecdote," said Philip Cook, a professor of public policy studies at Duke University. "They might have pointed to Washington, D.C., back in the days when D.C. banned handguns and yet had high gun-violence rates. Those bans are only at best partially effective, because the borders are permeable." Neither Wisconsin nor Indiana requires licenses or permits to purchase a gun, for example, nor do they require waiting periods. While Illinois has that B+ rating from the law center, Wisconsin has a C- and Indiana a D-. And there's good evidence that being next door to those states keeps Chicago criminals well-supplied with guns. A 2015 study of guns in Chicago, co-authored by Cook, found that more than 60 percent of new guns used in Chicago gang-related crimes and 31.6 percent used in non-gang-related crimes between 2009 and 2013 were bought in other states. Indiana was a particularly heavy supplier, providing nearly one-third of the gang guns and nearly one-fifth of the non-gang guns. New firearms trace data from the Bureau of Alcohol, Tobacco, Firearms and Explosives released last week likewise shows that Illinois as a whole faces a massive influx of guns. Of around 8,700 firearms recovered in Illinois and for which the bureau found a source state, more than half came from out of state — 1,366, nearly 16 percent, came from Indiana alone. By comparison, 82 percent of guns recovered in Indiana and traced were from within Indiana, suggesting that criminals in that state don't have to cross state lines, like those in Illinois, to get their weapons. All of this might suggest that criminals will just go to whatever lengths necessary get their hands on guns, regardless of whatever laws are in place. But that's the wrong way to think about it, Cook said. "No one's in a position to say that Chicago's various special regulations and Illinois's regulations are doing no good," he said, "because we don't know what the homicide rate would be in the absence of those." 2016 Gun Law State Scorecard. Law Center to Prevent Gun Violence. Firearms Trace Data — 2016. Bureau of Alcohol, Tobacco, Firearms and Explosives. "Gun Violence In Chicago, 2016." University of Chicago Crime Lab. January 2017. Phone interview with Philip Cook, professor of public policy at Duke University. Oct. 3, 2017. Phone interview with Adam Winkler, professor of law at UCLA. Oct. 3, 2017. "Some Sources Of Crime Guns In Chicago." Philip J. Cook, Richard J. Harris, Jens Ludwig and Harold A. Pollack. The Journal of Criminal Law and Criminology. 2015. "Tracing The Guns: The Impact of Illegal Guns On Violence In Chicago." City of Chicago — Office of the Mayor and Chicago Police Department. May 27, 2014.